After days of torrential Monsoon rains, parts of India are still in grave danger as rescue crews work around the clock to save stranded residents. The death toll rose in the last 24-hours from 106 to 324, more than three times Friday's death toll and it's likely to continue to climb. Families are still trapped on rooftops with some even sending messages on social media begging for help. 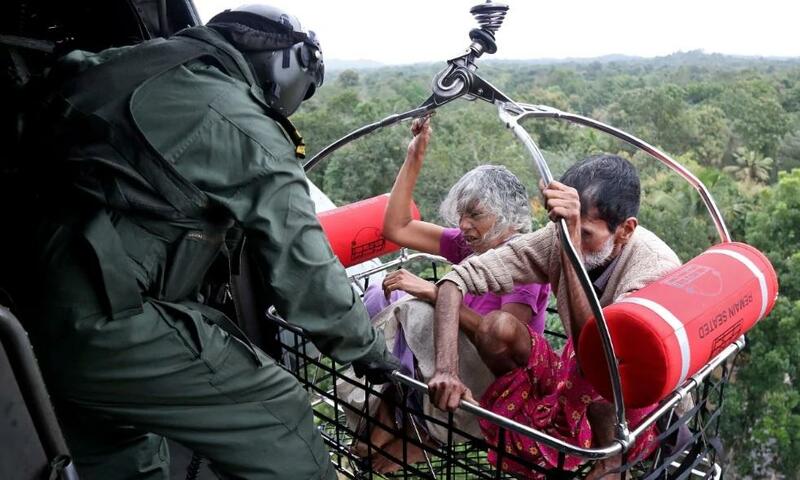 The country's Prime Minister Narendra Modi surveyed the flooded areas in a helicopter as hundreds of troops with dozens of boats helped evacuate now-homeless and stranded residents. The weeks of monsoon rains have not only flooded the southern state of Kerala but have also caused dozens of landslides which have been largely responsible for the high number of deaths. Pinarayi Vijayan, the chief minister of Kerala, reported that the flooding is the worst the state has seen in 100 years. In a statement to reporters, Vijayan said over 230,000 people were now living in over 1,500 emergency relief camps. There are fears that hundreds of people may still be stuck in trees and rooftops. In one village alone, 10,000 people are stranded after all of the surrounding roads were flooded. A state government official said, "We are deploying more boats and the army to ramp up rescue operations." The exceptionally bad flooding has been attributed to a spell of low pressure over the region, according to the India Meteorological Department.